I was struggling with being snappy, and short with my boyfriend. In addition to praying for patience and to be slow to anger, I decided to make this a game. Everytime I acted this way he could say “Angelica”. 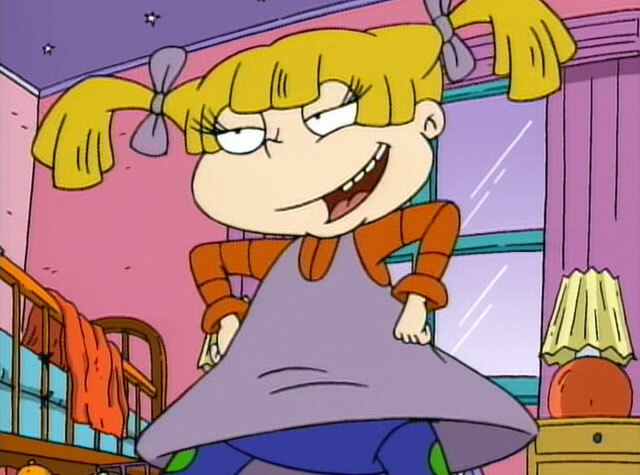 For those of you who didn’t grow up in the 90s with me, she is a cartoon character who appears in Nickelodeon’s show Rugrats. She is the spoiled brat and serves as the main antagonist of the series. This way he could point out to me in a funny way how I was acting. It could lighten the mood and we could joke about it. My coworkers and I constantly make funny comments and pick on each other in a loving way. Not a day goes by that we don’t laugh at each other for something. It puts us all in a better mood. Laughing is good for the soul. It’s contagious. Can you joke with your coworkers? Try lightening the mood and don’t be so serious all the time. I could go on and on about this one. If you do the same things over and over again you will get bored. I love variety and mixing things up. The best way I do this with exercise is by creating a game or changing the repetitions or time intervals of exercises to make it a new exciting challenge. Check out my favorite workout card game (http://becomepowerful.com/2017/10/20/fun-games-get-fit-play/ ). I do this in tons of different ways. One is game nights with my friends. We rotate different games and try new ones (again variety!). We’ve done a couple escape rooms. Check it out in your area. They have different themes and difficulties. Three, the more artsy side we’ve done things like handcrafted night out and wine & design. These are just a few examples for you to see how play is a part of everything in your life, and if it’s not, it should be. Later we will talk about how play is important in overcoming sorrow/times of grief, anxiety/depression, motivation to achieve goals and improve mood. Until then, find little ways you can play at work, in your relationships, being active and with others in your community. Amanda Fontaine is the Chief Fun Officer and Master Level Personal Trainer and Health and Fitness Coach at Empower Personalized Fitness. She is a Fitness Fun Expert and specializes in building creative, challenging and FUN workouts for her clients.